Home / No display / Do You Need To Do Basement Renovations? This is the question that all homeowners will consider briefly, but many choose not to. Why not? Because, there always seems to be something else that they would rather do, first. There’s always new siding, a new roof, or a new garage to put on the outside of the house. And, let’s face it, many will then look at the interior of their home and look at refinishing the floors, renovating the bathroom, or the kitchen. Then there’s the consideration of new windows, or improving insulation. So, should the basement be ignored? In most cases, it’s actually one of the first things you should look at. Many people forget that a lot of insulation problems originate with the basement of your home. Even basements that are unfinished have heating in them, and that’s not just for your comfort. There’s also the danger of pipes freezing if they weren’t, but if you’re ever in a home that has low heating in the basement, you’ll usually find that your feet are cold! So, you might ask yourself how do you fix this problem? In many cases, the answer is to insulate your basement. Now, this might seem like going a step too far, but putting in finished walls and raised floors in your basement is like adding a layer of insulation all around it. During the winter, this becomes very important, as your furnace doesn’t have to work as hard to heat that area. It is that cold air in the basement that can also affect the rest of your home. When the floors of the first floor of your home are cold, they’re going to make the first floor a little cooler as well. Again, that means that your heating bill goes up. So, with that some proper insulation and a raised floor, you can cut down those heating costs. The other case that many people overlook is an unfinished basement. Many basements have a slightly lower ceiling than other floors, but these basements can provide a great deal of extra living space. Imagine if someone came to you and said that without much effort, they can increase the square footage of your two storey home by fifty percent? 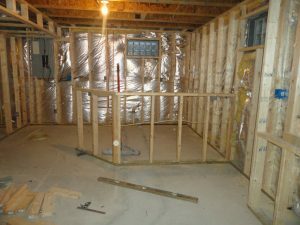 You’d probably think they were trying to fleece you, but that’s exactly what renovating an unfinished basement does: it creates a significant increase in living space within your home. For growing families, this can be one of the most important reasons for renovating your basement: you just might be in a situation where you’re expecting another child, and already have a full house. The first thought you’d have cross your mind is likely to move into a larger home, but for a lot of families out there who are already trying to pay off a large mortgage, this may simply be a solution that is out-of-reach. Even if you can afford a larger mortgage, the questions then becomes: do you want to? There are issues with taking on a more expensive home, not the least of which is the amount of time it will take to pay off the mortgage. There are people who have been forced to take fifty-year mortgages because that is what they can afford, or they prefer the lower monthly payments. By renovating your basement, you can take on a much more affordable loan, either by a line of credit, or by taking it out on your mortgage. This is far less expensive than buying a new home, and renovations like this, typically increase the value of your home. Home value is also one of the best reasons to have renovations done to your basement. One thing that is typically said of homeowners considering renovations is to look at it, not from the perspective of the home seller, but from that of the buyer. That means to stop thinking about what you want in your house, and to start thinking about what others would want in your house. For example: you might think that converting a room into a bar is a great idea, but there are many others who would prefer the extra room as a bedroom for their kids or an office, because they work from home. So, thinking on what other people would want from your home, should you sell it, will likely make you realize that an unfinished basement could be a potential turnoff to people interested in buying the house. Now, of course, this doesn’t mean you should take out a massive load of money from the bank and go nuts! The idea here, is to get the biggest bang for your buck. So, the best thing to do is decide on what you’d like to do in your basement and then have a contractor come in and do an assessment. You don’t have to do it all, but you might find some things on that list as being quite reasonable!